Let's be honest: Toyota is a name that's synonymous with quality and lasting durability, so it's easy to get a little lax or lazy with your basic car care maintenance needs and skip the day-to-day things that most people overlook or ignore. However, being a savvy car owner means also being on top of your car’s maintenance – and an important part of your vehicle’s maintenance has to do with the tires. It goes without saying how important tires are, but not everyone is familiar with all the reasons why. Tires provide traction in poor road conditions, but tire grips also play a large part in helping to slow and stop your vehicle. 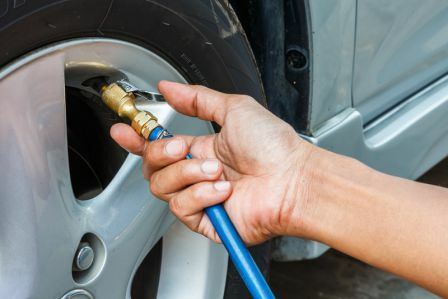 When you consider these factors, it’s not hard to see why you need to familiarize yourself with the tire maintenance basics, and that’s the Westbury Toyota team of car care experts has put together a short list of basic tire maintenance facts that everybody should know. In a perfect world, you’d never have to worry about your tire pressure. Unfortunately, the world isn’t quite perfect, and that means that tire pressure is something you should keep in mind regularly. Tire pressure is important because when the tires have the right amount, it enhances your vehicle’s overall handling and stability. It’s also crucial in regard to your car’s safety; tires that are under-inflated can increase the risk of loss of control or even a blowout. As the editorial staff of The Car Care Council explains, it’s normal for your vehicle’s tires to lose between one to two pounds per square inch (PSI) per month, so it’s not a bad idea to start getting into the habit of checking your tire pressure every time you fill up your car. A large part of routine tire maintenance is giving your tires a visual inspection whenever you head out to start your car. Even on a hectic day you should spare yourself 15 to 20 seconds to walk around your car and look at each tire. This will help you spot an obvious flat or a tire that’s extremely low in pressure, but can also indicate if there are any tires that might be a little under-inflated. It’s also not a bad idea to do more thorough sight checks once every couple of weeks. As helpfully pointed out by the writers over at InsuranceHotline.com, you want to look for obvious signs of damage or wear, like cracks, embedded objects, puncture marks, bulges, and uneven tread wear. Any of these damage indicators can seriously compromise the safety of your tires, so if you see any during a sight check, you’ll want to book your Toyota in with our car care experts as soon as possible. Getting your tires rotated routinely ensures that you get a longer lifespan out of your tires, which in turn leads to smoother driving – and the additional perk of cutting down on your fuel consumption as well. What’s more, tires that are properly and regularly rotated can cut down on the everyday wear and tear that your Toyota goes through, putting less stress on all the other parts. A general rule of thumb is to get your tires rotated every time you go in for an oil change (which is also something you need to do regularly!). If you encounter any of these with your car, it’s definitely time to bring it in for a rotation. Failing to do so might not seem like a big deal at the time, but it's definitely the easy way to both diminish the useful life of your favorite Toyota's tires and increase your risk of an incident on the streets of Long Island. Forming simple habits like checking out your tires every time you go to drive your vehicle and checking the tire pressure often can help you prolong the life of your tires, while at the same time increasing the longevity of your car’s other parts, too. If you create these habits and ensure your tires are rotated on a regular basis, you’ve basically earned an "A" in Tire Maintenance 101 as far as we're concerned. Don’t take your tires for granted like some people here on Long Island unfortunately do. At Westbury Toyota we want you to always enjoy your Toyota, and that’s why we put together this handy guide. Knowledge is power, and now that you’ve got it you can put it to good use!